Seriously? Just hours after posting about things that could go wrong, but might not? 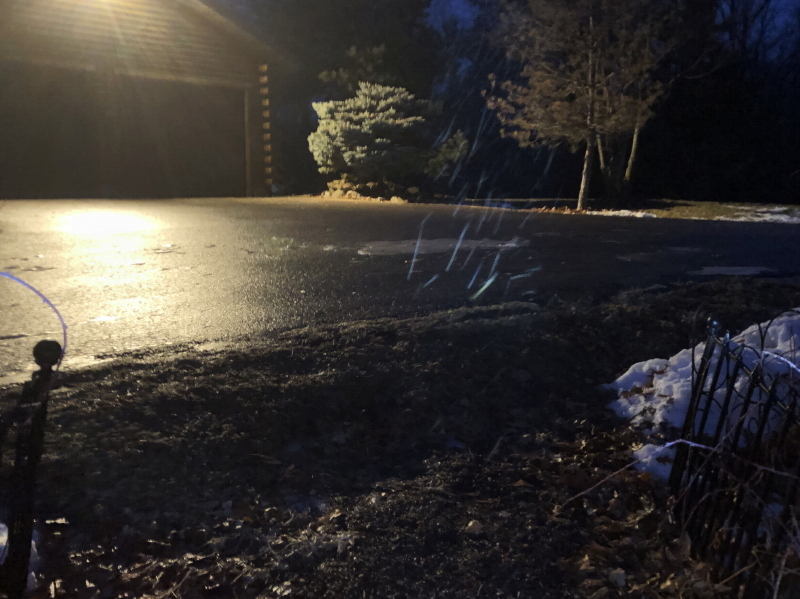 I was barreling along at the posted speed limit on the state highway between Beldenville and River Falls in the pre-dawn darkness around 5:20 a.m. yesterday, when a deer ran right into the side of my car door. BAM! Little did I know, a different deer running across the road in front of me just after I pulled out of our driveway ten minutes earlier, could have served as a warning. I hadn’t seen any deer on my morning commute for months before this. After passing plenty of fields and wooded areas where deer sightings could be expected, I reached the outskirts of River Falls, where there was a steel business on the right and a cul-de-sac of houses on the left. I wasn’t expecting this activity as the road made a slight bend to the right, distracting advance visibility. A deer suddenly appeared in my headlights from the left and I reacted by pulling my foot off the accelerator pedal. Before I could move for the brake, a second deer blasted into the door beside me with impressive force. The shock left me numb for a second and I coasted a little ways before deciding I should pull over and inspect the result of the impact. I don’t know if there were any others trailing along behind the one that hit me, but I didn’t see any more deer than the first two, and they were now out of sight. 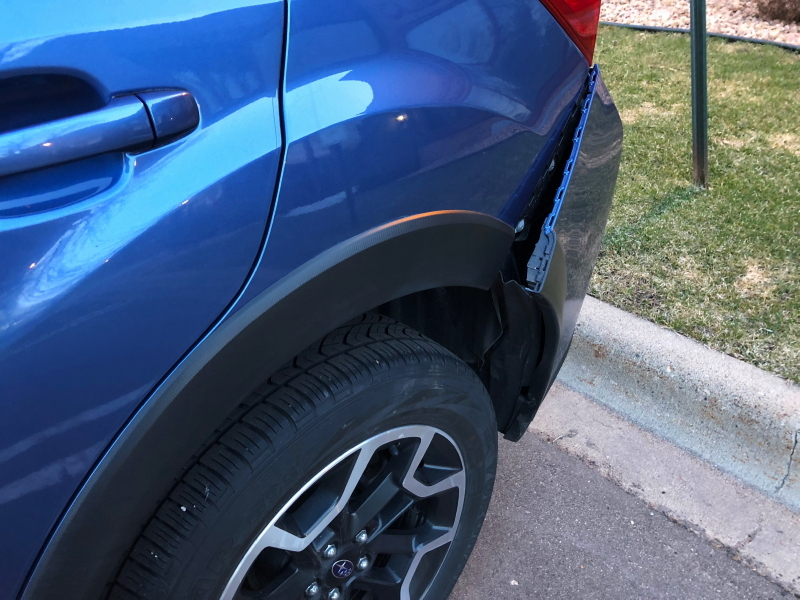 I suspect the deer swung around after the initial contact and then smacked the back bumper for good measure. My door was covered with a fair amount of hair. Shedding season, you know. Fortunately, no glass was shattered, and the function and seal of the door are still good. It’s going to be almost a month before my body shop can get to me. 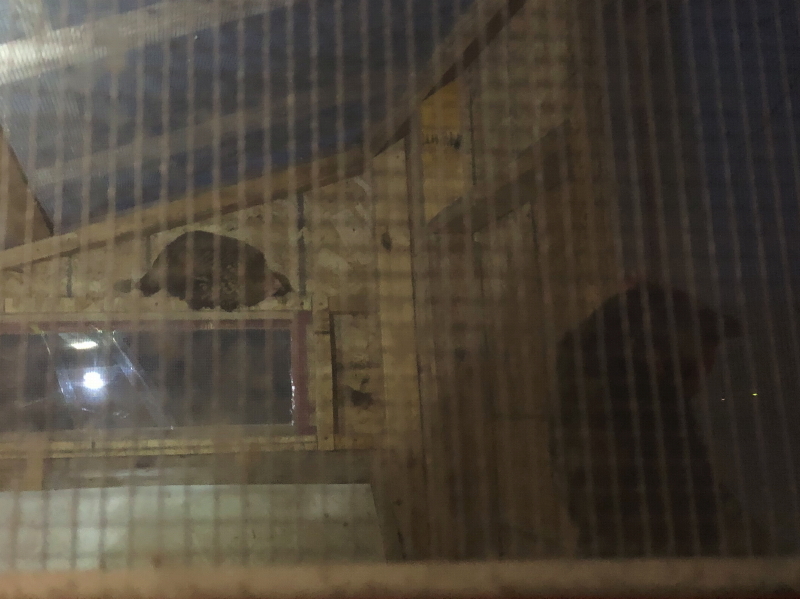 They are still backed up with appointments from ice and snowstorm damaged vehicles from the winter that didn’t want to end. The estimator said mine was the first of the spring deer damage incidents they’ve seen this year. We enjoyed a brief visit from the sun yesterday, which made quick work of melting areas I cleared of the small amount of snow left from the most recent precipitation. The front tire on the Grizzly held air, so the Slime patch appears to be working. After getting the driveway and barn areas plowed, I hand-shoveled to clean up nooks and corners, then parked the ATV for this photo and headed in for lunch. Once refueled, I ventured out again to shovel off the deck before turning my attention to plowing trails to make way for the bucket truck of the tree trimmers. I wish it had been a colder day. 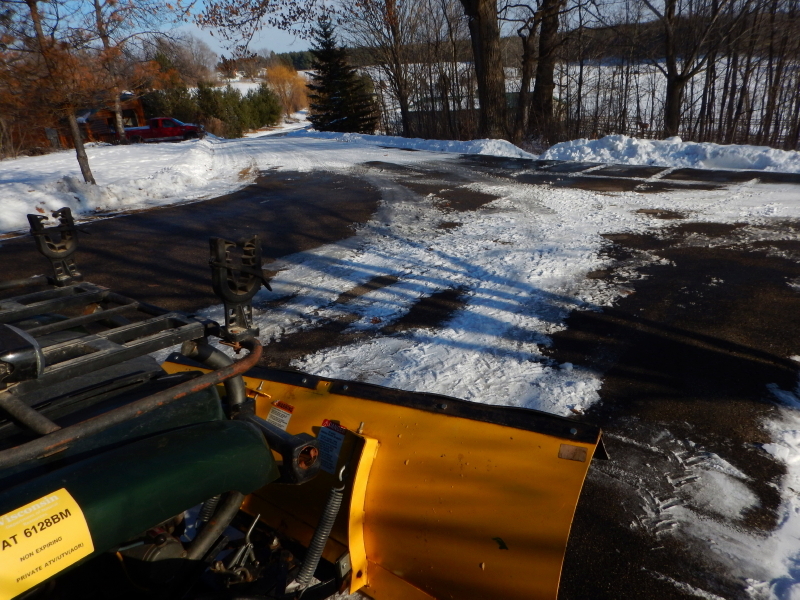 Our record-setting January thaw has left the ground a little soft in places and my plow blade tended to dig in to the muddy ground, peeling up large rolls of earth. There isn’t really any flat ground here, and as the angle of the ATV tilts, the result at the end of the plow blade gets exaggerated. That makes it very difficult to figure out a height setting of the blade that won’t be too high or too low. There really is no “just right” setting. 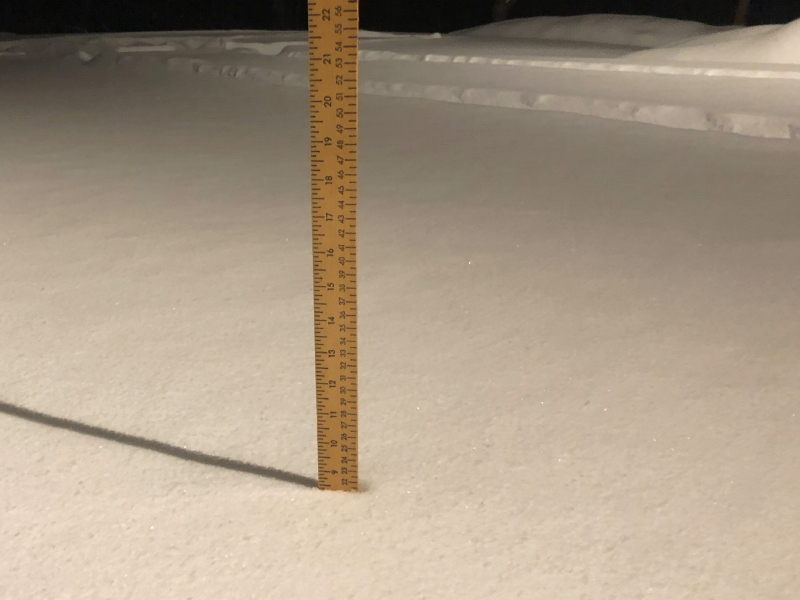 If it is not digging in a little bit on one side or the other, it is usually because it is not plowing any snow at all as a result of being too high. Regardless, I think I’ve established a drive-able section of two, maybe three, routes down our trails to reach a majority of the big trees we are hoping to have trimmed. I will not be surprised at all if the truck looks a lot bigger than I’m imagining once it arrives and attempts to turn the corners. “Was that on the estimate?” Uh oh. We headed inside to check, and sure enough, I was right. He was very apologetic. Said it was completely his fault that it got missed. Oh boy. Now I need to bring it back next week and drop it off again. People! At least it looks much, much better than when I brought it in the first time. Got what I wanted! Yesterday afternoon I completed the sale of my old car after just 4-days of listing it on Craigslist. The first person to test drive it made an immediate decision to buy, and offered my asking price. It couldn’t have gone any easier. I’m giving credit to Cyndie’s influence, as I needed her to meet the buyer for a test drive while I was at the day-job. Who wouldn’t want to buy a car from her? I think she charmed them into making the quick decision, then she drove home and they drove off to get the cash. I had the title with me and would connect with all of them back in the parking lot in River Falls on my way home from work. I got there first and picked an open spot in the parking lot where I would be easy to find. After a short wait, the buyer and his mechanic showed up. They presented the payment and I started filling out the paperwork. They seemed relieved when Cyndie finally pulled up with the car. The first thing she said to me was that I had parked in the exact same space where she had earlier in the day, when initially showing the car. Great minds think alike. After the deal was done, and we were safely on our way home in the car I purchased last week, she shared something else. While driving to meet us for the closing details, she noticed a sheriff approaching on the highway. He had his arm out the window and was gesturing to her to slow down. If she had gotten pulled over and ticketed, that would really have put a damper on the otherwise festive occasion. As it was, her little story just added a laugh to an incredibly smooth situation that played out for us yesterday. 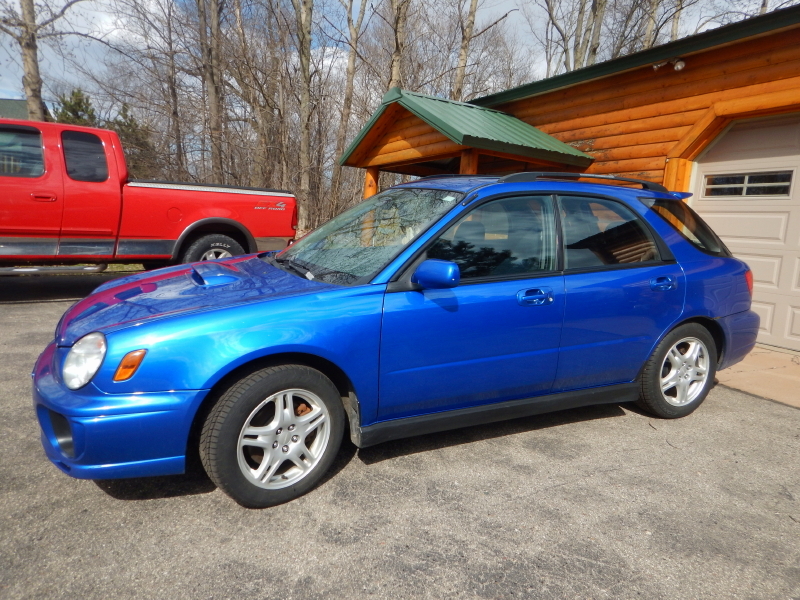 Goodbye, WRX wagon. You have been a great pleasure to own and drive. Seriously, how could I consider any other auto manufacturer when the cars I have been driving for years come from a company that uses “Love” for their marketing theme? Apparently, I was so smitten on Friday, I completely forgot to contact our insurance company about the lovely purchase. 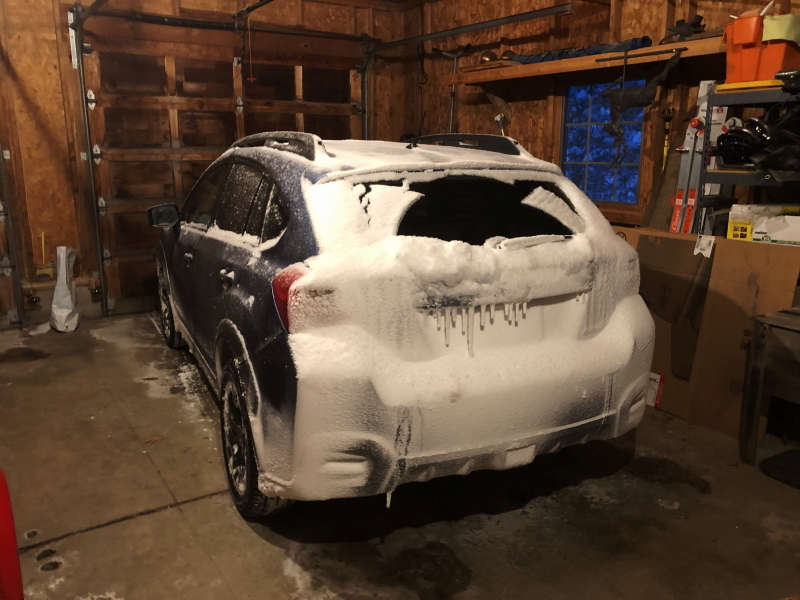 We decided to play it safe and leave the car in the garage until they can be reached on Monday. It was a little anticlimactic, not driving the new ride right away, but we didn’t want to take any unnecessary risks. 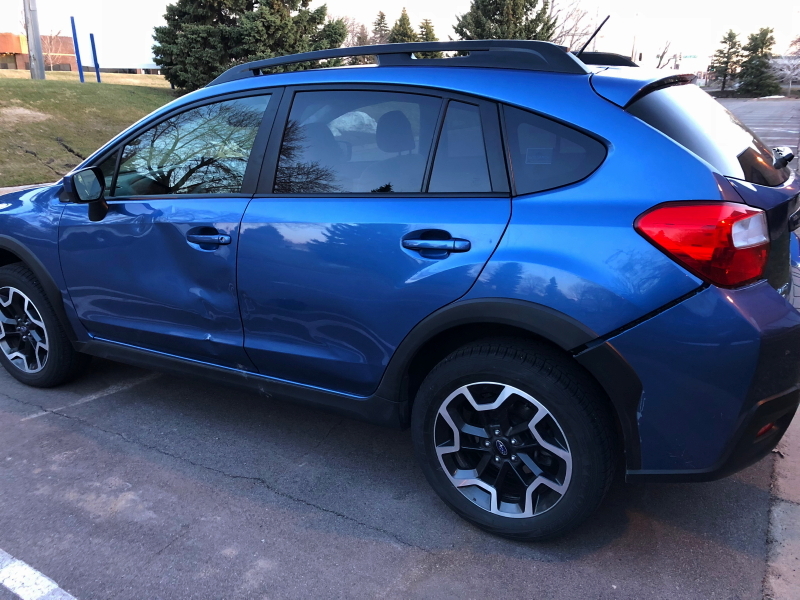 I have a fear that my luck for avoiding collisions with deer so far in the time since we moved to the country could run out, now that I’ll be driving a new car. That’s just the way the odds seem to work sometimes. I’m hoping I can rely on the love to keep deer from doing anything regrettable. I wonder if that could work with other drivers, too. It’s a Subaru. Feel the love. I suppose you could say this about most any day, but yesterday did not turn out anything like I thought it would when I woke up in the morning. One thing just led to the next and I ended up driving home in a new car. I credit the wise advice of my sister, Mary, who found several opportunities to urge me toward taking action, combined with Cyndie’s unwavering support. The ultimate decision happens to be a sure-fire way to fix the check engine light that kept coming on in the old WRX. The curious trigger that set the whole unplanned chain of events in motion was an exploding tire on the wheelbarrow we use more than any other tool. It is the key weapon in our arsenal for managing manure. I was turning and reshaping one of the compost piles when Cyndie arrived with a fresh contribution. I took the wheelbarrow from her to dump it on the pile and she noticed one of the tires looked curious. She asked if it might be flat, so I reached down to check it with a squeeze. It burst! Boom! It was flat now. Guess I don’t know my own strength. That was going to need repair without delay and forced an unplanned shopping trip. After a brief debate over eating lunch first or heading out immediately, we settled on the fateful decision to eat at home. During that pause, I received a call from my auto repair shop confirming the new exhaust sound I reported on the WRX was because the catalytic converter had busted. That news quickly confirmed it was time to take action on a plan I had mulled over for months. 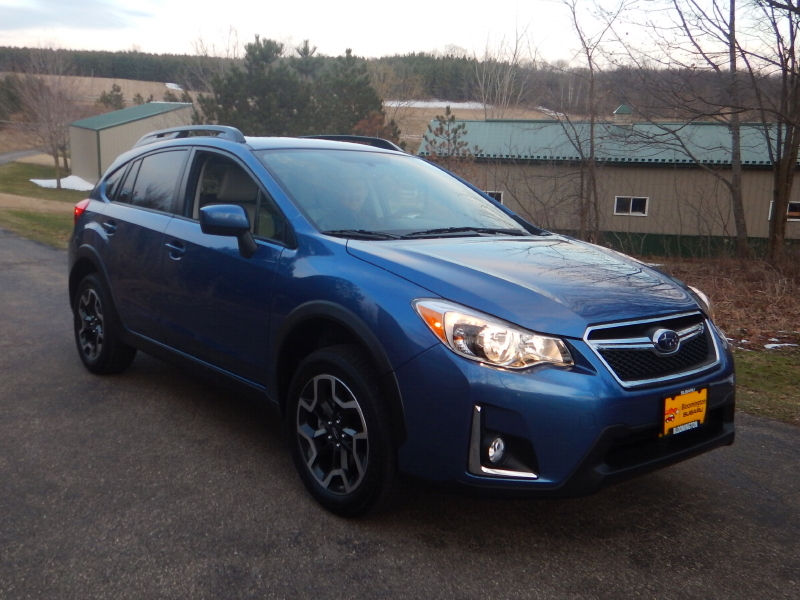 We altered our destination for finding a replacement tire for the wheelbarrow to a store in the same town as our safe deposit box, so I could get the title of the WRX. That car is now for sale. It just so happened that I had applied for an auto loan at our bank a few hours earlier in the day, to see how much new car I could comfortably afford. 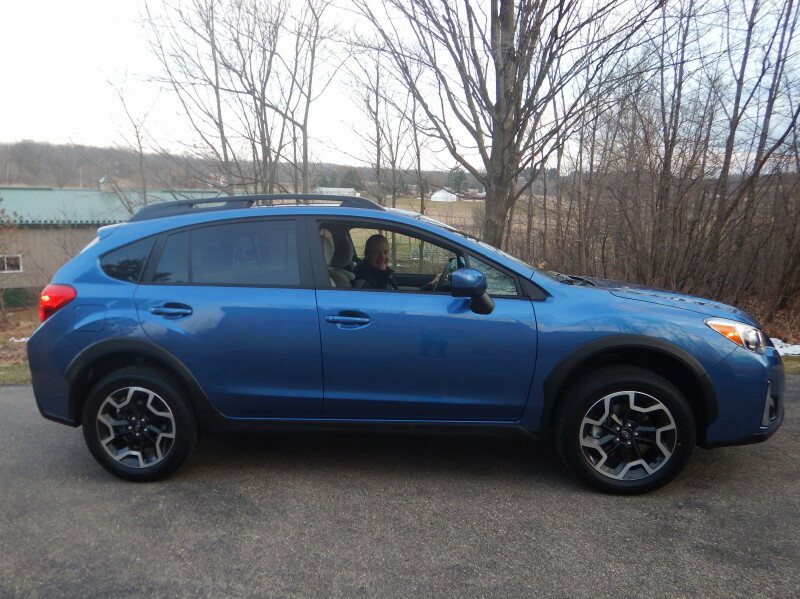 I talked Cyndie into driving a bit beyond the bank and Tractor Supply store, so we could test drive the next Subaru I was considering buying. 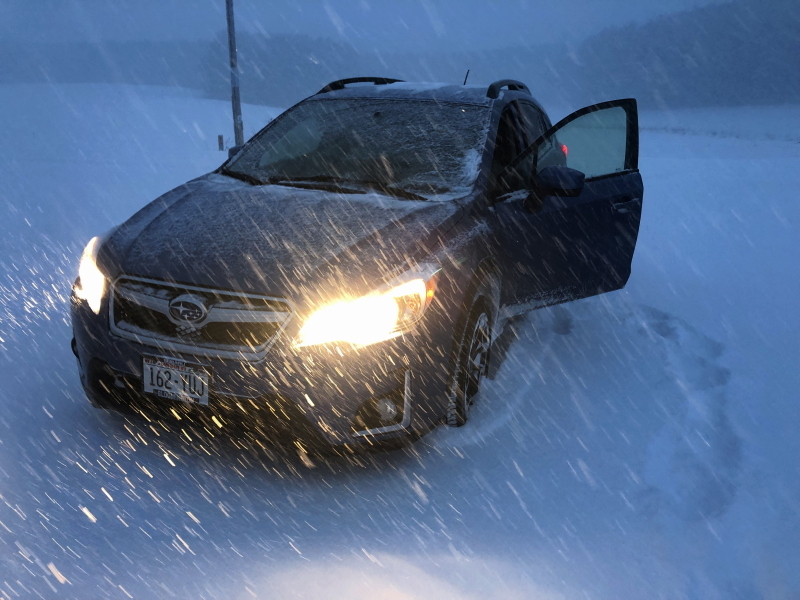 At the end of the day, I was driving home in a current model Crosstrek. It has been over 2 decades since I had that new car smell. For a guy who drags his feet making decisions, that was a flurry of significant ones in a single day, one after another. If it weren’t for that exploding tire on the wheelbarrow, I would have likely spent the day wondering what to do about that WRX. Now that problem will become someone else’s opportunity. 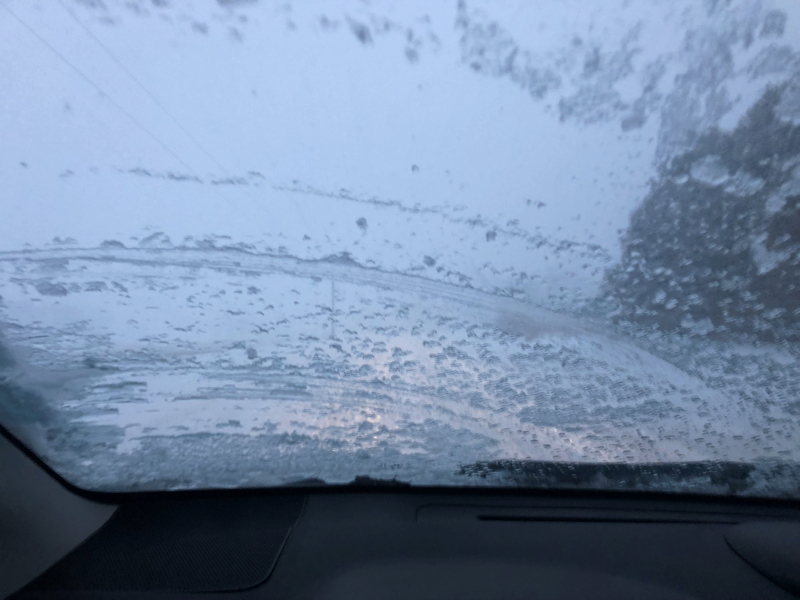 I’ve moved to higher ground clearance, so I won’t be busting a performance bumper on critters that jump in front of me at highway speeds, and I won’t be dragging my undercarriage on snow as often, when I leave in the mornings before roads get plowed.